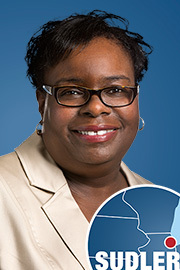 Suzette Johnson came to Sudler in 1996 with over 10 years’ experience in a management position at one of the top insurance agencies in the country. Recognized several times for her commitment to excellence there, she brought the same level of performance to serving Sudler clients. Today, Suzette supervises onsite management staff at a portfolio of mid-rise and high-rise condominiums and lofts. Her property-management experience includes facilitating large capital projects including balcony restorations, elevator modernizations, window replacements, and façade projects. Suzette earned the Certified Manager of Community Associations (CMCA) and Association Management Specialist (AMS) designations through the Community Association Institute (CAI). She is also an Illinois licensed Community Association Manager (CAM). Inspired by the words of Maya Angelou—“If you don’t like something, change it. If you can’t change it, change your attitude,”—Suzette also believes strongly in giving back to her community. Acting on that belief, she volunteers at a local food pantry, and sponsors several underprivileged children.